A Texan inspired ski lodge on the West end of Washington. This is a great place for the winter months in Houston. A cozy fireplace, tons of tables for all your friends, multiple beers bottled and on tap, and even some live music! It's definitely one of a kind in this flat and typically tropical climate. 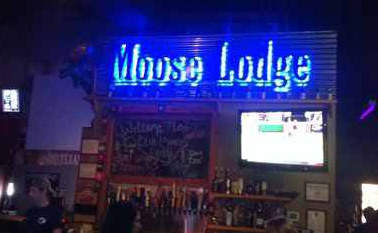 The Blue Moose is already known for being a great Happy Hour destination with daily drink specials in addition to the Lodge's own 16 oz. Blue Moose Brew going for 3 bucks every day! Overall this place does a good job of what it's trying to accomplish: a lodge vibe with heavy dose of Texas influence. Drinks are affordable, there's parking, but perhaps most importantly: the staff is incredibly friendly.